Non Prior Service Accession Course at Great Lakes, Illinois. Pay close attention and don't forget to study! Check out "My Boot camp!" Student Page Get requirements for your upcoming Boot camp! Check out IT3 Moses' Journal Page! Here's another Journal written by one of my Shipmates in Division 817. MARCHING PAGE! If your Reserve center hasn't gone over marching with you, well, you better check this page out. It is important that you at least have a clue to what commands they are calling out to you before hand. Pay close attention to when they call out the command and when they call out the execution of the command! Don't anticipate a command! 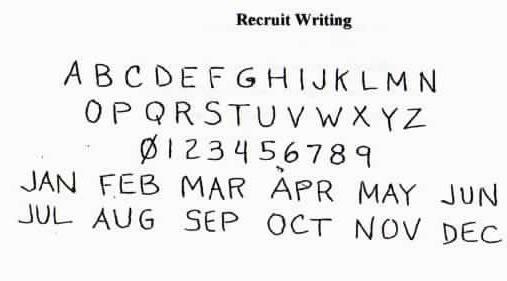 Learn Recruit Handwriting! This will be your new way of writing for the entire 2 weeks you are in boot camp! Also, at your reserve center and all throughout your Navy career, you will be expected to write pretty much the same on all Military forms. Block capital letters and don't forget to cross your zeros! NAVY RANKS & RIBBONS Make sure you know your collar devices for Chiefs and Officers!!! You'll use them on inspections and if you happen to run into an officer on the street. You do not want to get yelled at for not saluting or saluting a chief! Also, make sure you recognize Petty Officers and chiefs. Chiefs get mad if you call them Petty Officers and Petty Officers will laugh at you when they're called Chiefs. Important Note: At Great Lakes, determining a Chief from an Officer can be hard, especially since they both wear khaki. So make sure you pay close attention to the collar devices. Don't call an officer Chief cause that might not go to well, and if you salute a Chief he may be flattered but chew you out for not recognizing! Either way, most likely you will not win cause they're so darn uptight on base!! Good Luck! Recruit Training Chain of Command (straight off NPSAC website for up to date list) They will have you recite these and it will be asked during an inspection. Get ahead of the game and learn them, but make sure if you don't go to boot camp in the next month that right before you go get an updated list because positions may change and you don't want to be memorizing an old chain of command. Battle Stations.. I am not going to reveal anything about Battle stations because it is an experience you can not practice for. I will give you one piece of advice you can practice ahead of time... TEAMWORK!! If you don't exercise that before the day of Battle stations, you will not make it!! Download and Watch Power Point Presentations! These are very big files so if you have Cable or DSL it will download very quickly! If you have dial up, (like I do) get a friend with a faster connection to download, otherwise it will take forever!! I also can make available a burned copy of all of these power point presentations, all the stuff you will need to know plus the very cool INTRODUCTION TO THE NAVAL RESERVE VIDEO on a disk for FREE. Just email me only if you are serious and I will send it out to you!! P.S. If you join I would appreciate being listed as the referral!! I am committed to excellence and the fair treatment of all. 2. To walk my post in a military manner, keeping always on the alert and observing everything that takes place within sight or hearing. 6. To receive, obey, and pass on to the sentry who relieves me all orders from the Commanding Officer, Command Duty Officer, Officer of the Deck, and Officers and Petty Officers of the Watch only. 9. To call the Officer of the Deck in any case not covered by instruction.